Pick Analysis: One of the best athletes in college football, Jackson has made plays at USC on offense, defense, and special teams. He started at cornerback and receiver as a true freshman against Notre Dame. He was named a Freshman All-American, Pac-12 Defensive Rookie of the Year, as well as honorable mention all-conference (49 tackles, 10 pass deflections, 10 catches for 138 yards, three receiving TDs, two kick-return TDs). League coaches named Jackson a first-team All-Pac 12 defensive back in 2015 (one INT, eight PBUs). He was a second-team pick as a returner and finalist for the Paul Hornung Award as the nation's most versatile player contributing on offense (27-414, two TDs) and special teams (941 total return yards, two punt-return TDs). As a junior, Jackson won the Jim Thorpe Award and was named first-team all-conference and All-American after a strong season (five INTs, 11 PBUs.) He scored four times on returns, two on kickoffs and two on punts. In 2015 and 2016, he earned All-American honors in track. He ran a career-best 10.38 seconds in the 100 meters in the 2016 outdoor season. The Tennessee Titans select USC cornerback Adoree' Jackson No. 18 in the 2017 NFL Draft. Published: April 27, 2017 at 10:31 p.m.
NFL Media's Matt Smith, Bucky Brooks, and Lance Zierlein give Adoree' Jackson a B+ draft grade. Published: April 8, 2017 at 09:37 p.m.
Everything you need to know about USC cornerback Adoree' Jackson. 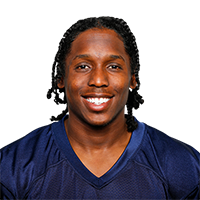 Published: March 22, 2017 at 09:45 p.m.
Watch former USC cornerback Adoree' Jackson run through field drills during his Pro Day. Published: Jan. 12, 2017 at 03:01 p.m.
Take a look at highlights of USC cornerback Adoree Jackson against Notre Dame in 2016. Published: March 29, 2017 at 06:57 p.m.